Reliance Jio New Plans: Now that the Summer Surprise offer is coming to an end, there are new Reliance Jio plans on offer, while most of the old plans have been revised. The recharge amounts still start from Rs. 19, going all the way up to Rs. 9,999. Some of these Reliance Jio plans have been revised bringing new validity options. New recharge plans for amounts Rs. 349 and Rs. 399 have been added, and the Rs. 309 and Rs. 509 plans that were introduced for Dhan Dhana Dhan plans now have different validities. Moreover, the Reliance Jio Dhan Dhana Dhan offer is only available for the new Rs. 399 plan now with 1GB data per day. Reliance Jio Postpaid plans have also been revised with more validity and data. 399 plan now offers 3 months validity with 1GB data per day and others offer 2 months validity. Check out the list below. 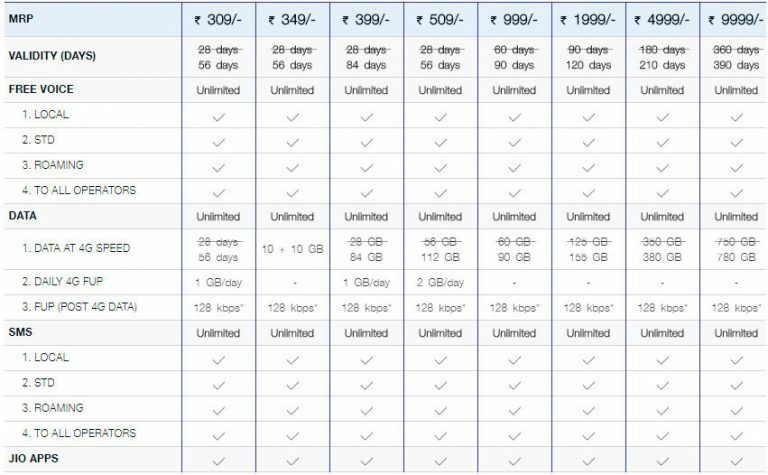 All the new prepaid and postpaid plans of Reliance Jio are now available on the Jio.com A website, where you can see them detailed.